I haven't blogged in many months, but today is a day that cannot go by without notice. We were attacked by Al Qaeda on that day ten years ago - more specifically by 19 Saudi nationals - and Al Qaeda is still intent on more murderous attacks on our country. Although today's readings at Mass were all about forgiveness, my thoughts were on our servicemen and women who are waging war against Al Qaeda today. May God keep you all safe and may you smite that enemy, and then some. Today seemed like a good day to make a donation to Soldier's Angels, and so I did. My thoughts and prayers go to all the people who lost family members and cherished friends on that day, and to the almost incomprehensibly brave first responders who perished on that day. My brain still can't wrap around firefighters climbing up into a skyscraper that was a burning inferno of jet fuel, heading up while thousands of people are frantically trying to get out of the burning building. There are no words for that bravery and committment to a higher cause, to the point of losing one's life. We lost an aspiring firefighter on that day, carpenter Christpher Michael Kirby, then only 21. He was the son of a Bronx firefighter. I first learned about Chris five years ago when I participated in the 2996 project. He sounded like a truly wonderful soul, someone who lightened up the world for everyone around him, who made people laugh and smile. There aren't enough people like that, are there? To have lost "Happy" seems as awful today as it did ten years ago. May his memory and spirit live on in the hearts and minds of all who knew him. We can say prayers for the repose of his eternal soul, but my hunch is that God has already put him to use as a guardian angel for others. The Anchoress has dozens of excellent links today. Never forget, indeed. We are living in a continuous state of apprehension, counting the days until the next attack and repeating the now-standard mantra that we will only unite more when — not if, but when — we’re hit again. That we’ll strike even harder, more righteously, and more effectively. We have spent a year failing to synchronize the necessary ideas with the necessary actions. Our borders remain scandalously porous: tuck a suitcase bomb into the truck of your car and drive right in from Canada. We delude ourselves by thinking that a photo ID is proof against evil intent. We allow our e-mails to be invaded by our dubiously named Department of Justice while nests of terrorists undoubtedly continue to thrive in our territory as they do in Europe. We countenance an absurd policy of "random" scrutiny of airplane passengers rather than engage in thoughtful profiling, lest we be accused of racism. Our president spends ample time cozying up to the smarmy representatives of the House of Saud — oil is king — while we require nothing of that monarchy by way of assisting us in locating terrorists. If anything is of use, we eschew it; if something is pointless but looks good on the evening news, we go with it. We have resolved nothing. We have managed to offend those we shouldn’t, like the Israelis, by excluding them entirely from our plans to confront Iraq, but not those we should, like the Pakistani government, which countenances terrorist encampments in its territory, and, again, the Saudis, who mount telethons to fund the families of homicide-bombers in Israel, blatantly giving their imprimatur to terrorism. 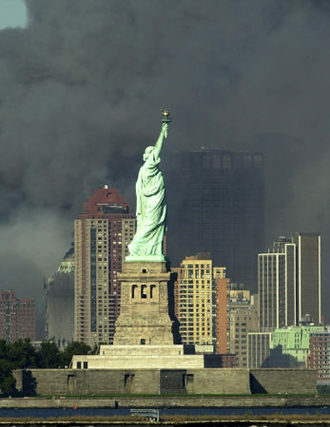 To fear offending an enemy who took down the two towers of the World Trade Center, drilled a hole through the Pentagon, and left a death pit in Pennsylvania is a strange way to bind the nation’s wounds. We did not come together after September 11. It wasn’t, even in the most metaphoric and hope-filled sense, "the best of times." It was the worst of times. Not solely because of the death and destruction of that day, but also because of what we’ve become in its aftermath: preposterously maudlin. Ineffectively incendiary. Painfully earnest. Muddled. We are foolishly polite when we need to be fiercely determined. To give this vaunted "war on terrorism" legitimacy and determination and purpose, we might recall the words of "The Battle Hymn of the Republic," written in 1861, during a time of national crisis like none we’ve seen till now. The Civil War was waged to save the republic; today’s war against Islamist terrorism must be waged to save Western civilization. It requires precisely, in Julia Ward Howe’s unparalled image, that "terrible swift sword." A special prayer goes out to the family and friends of Chris Michael Kirby, who would have been a 30-year old man this year, had he not been murdered that day. I was given Chris's name when I signed up to participate in the 2996 Project. The people who knew him all remarked upon his contagious smile and how he made every one around him laugh, no matter what the situation. He is sorely missed. May Chris's wonderful spirit live on in the hearts of all the people who knew him. Lucianne.com asks "What Will You Do Tomorrow?" I'd also say a prayer of thanks to President Bush, who prevented another attack on our country during his time in office. (Unlike Spain, Indonesia, England, Pakistan, to name just a few places that have suffered terrorist bombings in the intervening years). I'd also pray for President Obama that he do what it takes to match Bush's success in preventing a terrorist attack on our soil. Finally, a prayer for the parents, family and friends of Chris Michael Kirby. His smiles, laughter and jokes are surely greatly missed by them. I first found about about Chris in 2006 when I participated in the 911 Remember project. 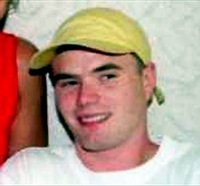 Chris, nicknamed Happy, would have been 29 this year. The death of someone so young (only 21 when he was killed) goes against nature. The pain of a young person's death doesn't seem to lessen much with time, if anything the loss seems even greater as time passes. Resquiat en pace, Chris. Another September 11th comes and goes, and no terrorist attack on our country since that day. My prayers go out to President Bush, who has certainly done something right to prevent further terrorist attacks. It's not that people who hate us and wish us wiped off the face of the earth aren't trying. They're disappointed that only 3,000 Americans died that day, they were hoping for tens of thousands of corpses. My prayers also go out to all the people who died on that day and to their families, with a special prayer for the repose of the soul of Chris Michael Kirby. His smiles, laughter and jokes are no doubt greatly missed by his family and many friends. Chris, nicknamed Happy, would have been 28 this year. The death of someone in the prime of his life seems so wrong. Sissie did a lovely thing today, she printed an excerpt from Pope Benedict's prayers offered when he visited Ground Zero in April this year: "Our hearts are one with theirs, as our prayer embraces their pain and suffering." Nice touch, Sissie. "Proselytizing in the name of Allah has not been undermined, and has not been set back 50 years, as we thought in the first days after September 11. On the contrary, the 11 days that have passed are like 11 years in the history of proselytizing in the name of Allah. I write to you today with the absolute confidence that over the next few years, Islam will spread in America and in the entire world...."
Wow, the compassion overwhelms me. Fitaihi was crowing about spreading Islam only eleven days after 3,000 people were murdered by Islamist jihadis. I repeat, Dr. Walid Fitaihi is one of four trustees of the Islamic Society of Boston. "Even a cursory survey of world history explodes these romantic clichés and noble-savage fantasies. The West’s sins have been the sins of humanity everywhere. But the goods of the West—political freedom, consensual government, human rights, rationalism, and respect for the individual, to name a few—are unique to the West and account for its success. Just ask the millions of non-Western Others who every year risk their lives to migrate to Europe and America, even as virtually nobody goes in the other direction." "Unlike the old tragic vision of the classical West, which saw human suffering as the consequence of an imperfect human nature and our own bad choices, the therapeutic sensibility sees suffering as a temporary glitch caused by unjust social and economic structures." Hmmm, that fits in well with the Marxist/socialist thinking that dominates the Left. There is a refusal to believe that evil exists in the world. Everything is relative, even such abhorrent practices as female genital mutilation. Who are we to criticize someone's religious or "cultural" practice? We no longer believe that there's a Satan, if you will. All bad things in the world are caused by capitalism. If only we could demolish capitalism and create some sort of Utopian economic system, there would be no more war, poverty, illiteracy, crime, hunger, etc. As if! "Such hypersensitivity compromises our fight against Islamic radicalism in a thousand ways, ranging from self-censorship....to politically correct warfare that refuses to accept the brutality, destruction, and death that have always been the cargo of war." "All great leaders since Moses have known that a feared enemy must be crushed completely. (Sometimes they have learned this the hard way.) If one ember is left alight, no matter how dimly it smolders, a fire will eventually break out. More is lost through stopping halfway than through total annihilation: The enemy will recover, and will seek revenge. Crush him, not only in body but in spirit." I don't think we've been doing enough of that. Our thoughts and prayers go out today to all the people who were killed on September 11th, 2001, and to their families and friends. A special prayer goes out to the family of Chris Michael Kirby, the 21-year old carpenter from the Bronx who was killed in the attack on the World Trade Center. "But remembrance without resistance to jihad and its enablers is a recipe for another 9/11..... Not every American wears a military uniform. But every American has a role to play in protecting our homeland–not just from Muslim terrorists, but from their financiers, their public relations machine, their sharia-pimping activists, the anti-war goons, the civil liberties absolutists, and the academic apologists for our enemies." New York Daily News 911 photos here. Chris Michael Kirby - "The Smiles He Left on Everyone's Face"
"the smiles he left on everyone's face"
"he told the funniest jokes"
"his comforting smile and uplifting laugh"
"the smile on his face"
Little Chris was only 21 when he was killed in the attack on the World Trade Center. But he packed a lifetime of laughter, support and companionship into those 21 years. He reminds me of my own brother Danny, who would (literally) give the shirt off his back to a stranger. I bet Chris is the kind of guy that God sends back to be someone's guardian angel. In fact, he might be training guardian angels by now.
" At Yankee Stadium last summer, Chris Michael Kirby raced up and down the escalators looking for a young boy who had wandered off. The boy's father had been frantic, and Chris had offered to help. Finally, Chris spotted the boy stepping into the women's bathroom. He ran in after him, calling out, "Coming in, girls!" The son of a Bronx firefighter, Chris grew up in a family used to helping strangers. "He was a great kid — he would help anybody," said his father, Mickey Kirby." Chris, who was born on New Year's Day, was nicknamed Happy because of his happy-go-lucky nature. He was working as a carpenter while taking classes to become a firefighter like his father. A scholarship fund was established in his memory, contribution may be made to the Chris M. Kirby Scholarship Fund, Pine Bush High School, Rte 302, Pine Bush, NY 12566. God bless, Little Chris! Chris Michael Kirby, a carpenter, died tragically September 11, 2001 during the attack on the World Trade Center. He was 21. The son of James "Mickey" Kirby and Donna Morrison Kirby, he was born on January 1, 1980 in the Bronx. He was a member of Carpenters' Union #608; and was in the process of fulfilling the requirements to begin a career in the FDNY like his father, Mickey of FDNY, Engine 43. I'm participating inthe 2,996 Project, a tribute to the victims of 9/11. 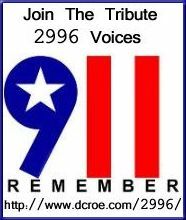 2,996 volunteer bloggers have each "adopted" someone who was killed on that day. Each person will pay tribute to a single victim. My guy is Chris Michael Kirby, 21. I don't know anything about this young man yet, but I'll do some research and write wjhat I learn about his life and character. As the 2,996 website says, "We will honor them by remembering their lives, and not by remembering their murderers." "We do this in honor of those who lost their lives on 9/11, their families, friends and loved ones who continue to endure the pain, and those who today are fighting at home and abroard to preserve our cherished freedoms. In the days, weeks and months following 9/11, our country was bathed in American flags as citizens mourned the incredible losses and stood shoulder-to-shoulder against terrorism." It would be pretty cool to see thousands (millions?) of flags flying on September 11th.